If you stay faithful, Samsung will knock $100 off the price of a new phone. In the U.S., the company is giving customers a $25 bill credit through carriers and retailers to customers who return a Note7 for a refund or for any other branded smartphone. 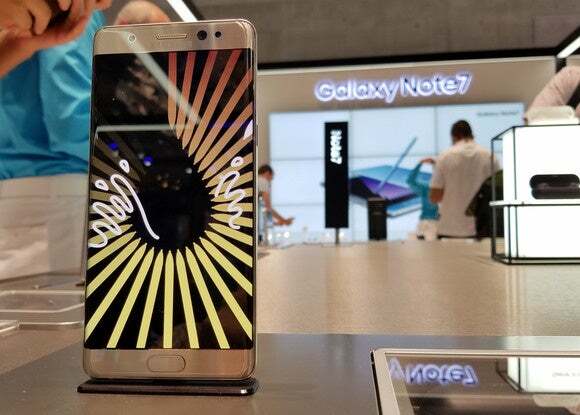 But if they choose to exchange the Note7 for any Samsung smartphone, they will get a whopping $100 bill credit from select retailers and carriers. The company did not immediately provide further details on the program. Besides bill credits of 30,000 won ($27) that can go up to 70,000 won, users in Korea were allowed to keep gifts like the Gear Fit2, which they received when they bought the phone, according to Yonhap News Agency. In an analyst report soon after the guidance cut, Macquarie Research wrote that Samsung has been “resilient” in the mobile phone market, and weathered many crises, including the “flop” of the Omnia smartphone running the Microsoft mobile operating system and patent litigation from Apple. Macquarie warned that some potential Note7 buyers, who it estimates could have accounted for sales of 14 million phones, may now move to Apple’s iPhone or phones from other vendors, which seems to explain the largesse Samsung is bestowing on Note7 users who stay with the company’s smartphones.